Although many of us at the New Jersey shore enjoyed an extended summer this year with mild temperatures extending into October, fall has finally arrived; bringing with it a plethora of warm colors as the leaves begin to change, the days become increasingly cooler, and seasonal décor begins popping up. Decorating the home for fall can be one of the most fun projects of the year! I set a self-imposed rule years ago that I would refrain from digging out my pumpkins, scarecrows, and autumn floral arrangements until fall officially starts on September 22. This year, I have to admit that I’ve been remiss in decorating for autumn as the milder temperatures kept me thinking/wishing summer would never end! 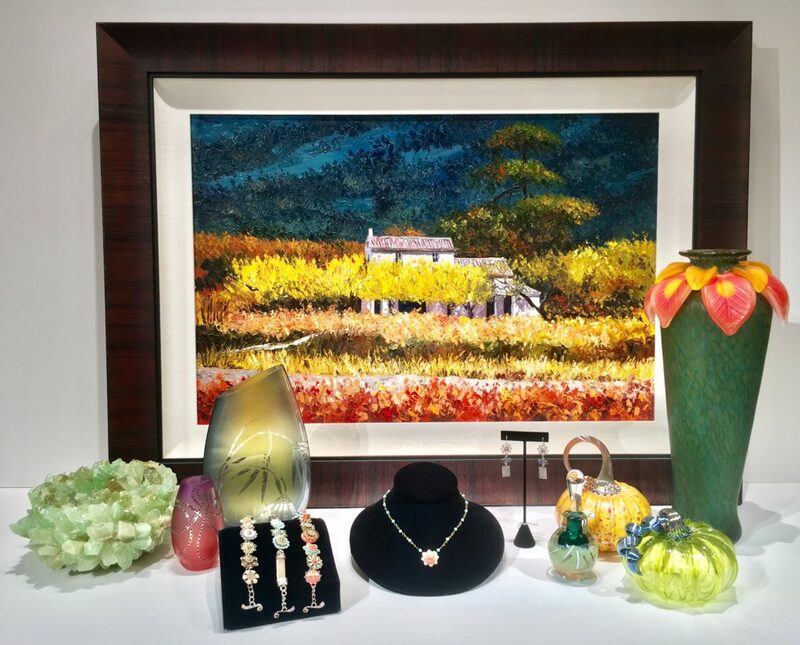 Last week, however, as our newest collection of artwork, glass sculptures, and other treasures started to arrive, I could barely contain my excitement in displaying these magnificent pieces at our galleries in Stone Harbor and Avalon, NJ. Admittedly, a few of the new items ended up in my home as they were just too good to pass up! While it can be fun to decorate for Christmas, Spring, or whatever holiday or season comes along throughout the year, there is something about the warm, rich colors of fall that make decorating this time of year a lot of fun and truly transformational. This year, I am obsessed with Jack Pine’s glass pumpkins. 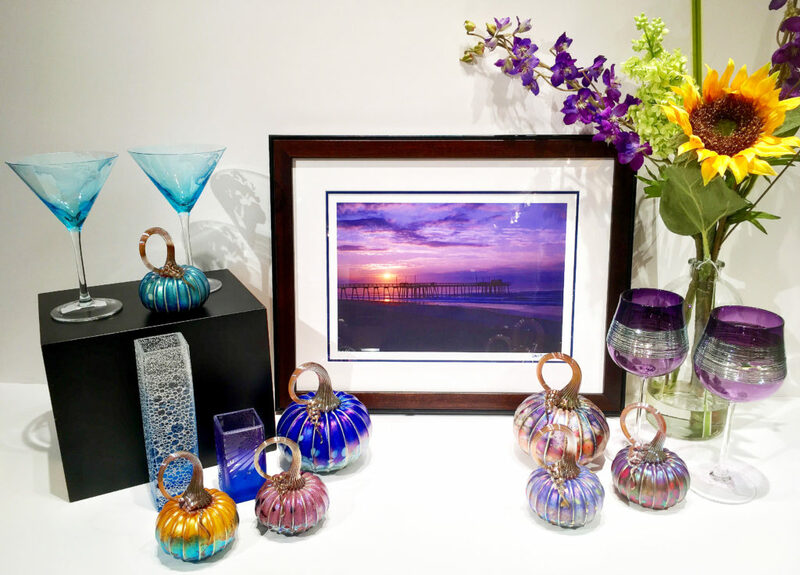 They are exquisite pieces of hand-blown glass art that can be displayed all year long. 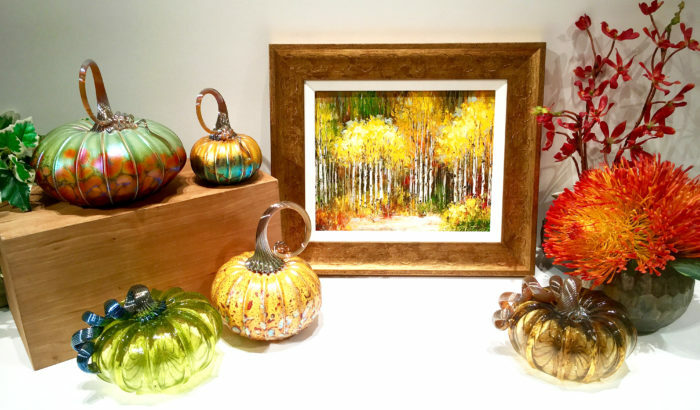 The artist creates the pumpkins and other beautiful glass decorative pieces in a variety of sizes with a goal of creating organic art forms that incorporate incredibly rich colors and his unique style. Another great way to celebrate this magnificent harvesting season is to incorporate the warm colors and styles of the season into your jewelry and clothes. With that in mind, I fell in love with the latest jewelry designs by Ann Egan and Ellen Kelly. Many of Ann Egan’s pieces incorporate earthy, fall colors. Eagan designs her stunning pieces juxtaposing color and shapes as a painter or a mosaic artist might, but also incorporating her knowledge of metal to create pieces that are truly works of art. Like Egan, Ellen Kelly uses an eclectic blend of metals and other mediums to create fashionable necklaces and earrings that make an artistic statement. We recently introduced a new line of platters and bowls that take a very creative and subtle spin on nautical themes, which is always a hit with shoregoers. Many of these new pieces come in colors reflective of the fall season, yet versatile enough to use all year. Years ago, I learned that an easy and inexpensive way to make your home feel like “fall” is to simply incorporate autumnal florals into your home – whether you add a few yellow, orange, and burgundy tones to your existing silk arrangements, or shop for sunflowers, mums, and other fresh flowers, this little touch that will give warmth and seasonal appeal to your home. One of the other home decorating tips I learned about years ago and still try to follow is to simply switch up some of the artwork in my home to let those pieces with warmer tones steal the spotlight. We have created a collection of etchings and paintings to cover small accent walls in your home that would add holiday charm. If you are visiting southern New Jersey this fall, we hope you will take time to stop by Ocean Galleries and check out our newest collections of autumnal art. We are convinced you will Fall in Love!